1. Enable IMAP in Gmail. Don't forget to click Save Changes when you're done. 4. Click Add a new e-mail account, then click Next. 5. Choose IMAP as your server type by clicking the radio button, and click Next. 7. Click More Settings... and then click the Outgoing Server tab. 8. Check the box next to 'My outgoing server (SMTP) requires authentication' and select Use same settings as my incoming mail server. 9. 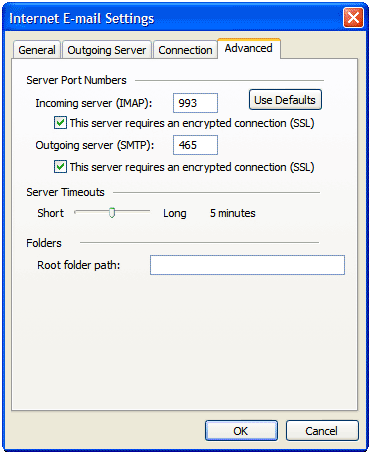 Click the Advanced tab, and check the box next to 'This server requires an encrypted connection (SSL)' under Incoming Server (IMAP). Also, enter 993 in the Incoming server (IMAP) box. 10. Check the box next to 'This server requires an encrypted connection (SSL)' under Outgoing Server (SMTP), and enter 465 in the Outgoing server (SMTP) box. 12. Click Next, and then click Finish. 13. Download the latest updates for Outlook from Microsoft. This will help prevent the most common Outlook errors that Gmail users see. 14. Check our recommended client settings, and adjust your client's settings as needed.